Send a Thank You Gift Basket as an employee recognition gift, teacher thank you gift, retirement gift, sympathy gift thank you, business thank you gift, realtor thank you gift. Buy giving them a thank you gift that is custom tailored with your Personalized Message and comes with an array of gourmet treats, they will truly know just how much their thoughtfulness and efforts mean to you. included with all of our Thank You Gift Baskets! A Very Special Thank You Gourmet Gift BasketLooking to say Thank you in a special way? This gourmet thank you gift basket is sure to impress all your clients or anyone you want to express your sincere appreciation too. 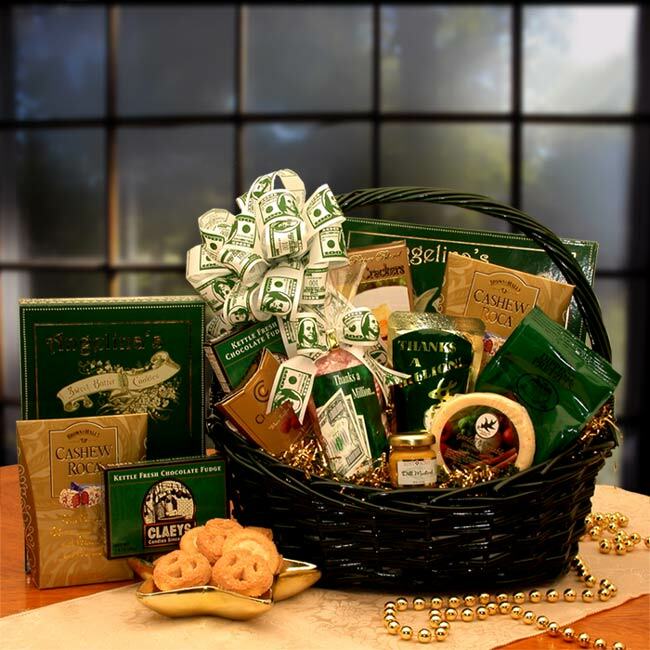 We've included a delicious assortment of goodies for them to savor. Many Thanks! Gourmet Gift BasketMany, Many Thanks to you for all you do! That's what you are trying to convey when sending a thank you gift and the Many Thanks Gift basket is sure to express your sincere thank you upon opening it. The custom thank you bow is just the right touch to express your sincerest thanks.